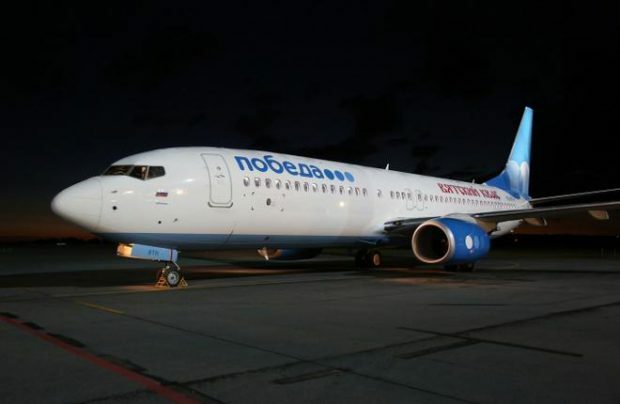 Russia’s low-cost carrier Pobeda has reached its goal of carrying four million passengers annually, a month in advance. The goal was set in September by Vitaly Savelyev, the general director the parent company Aeroflot. The airline is now planning to reach 4.2 million passengers by the end of the year, a 30% increase over last year’s figures. In January though October, this yearly increase reached 46.9%, to 3.624 million passengers. Pobeda in this time was the sixth largest Russian passenger carrier. The four millionth passenger was carried aboard a St. Petersburg – Rostov-on-Don flight on December 1. The airline operates seven routes out of St. Petersburg, including to Rostov-on-Don, Vladikavkaz, Volgograd, Yekaterinburg, Kirov, Makhachkala and Nalchik. The fleet of Pobeda consists of 12 Boeing 737-800s, with an average age of six years. The route network of the airline includes 37 destinations, 11 of which are regional flights carried out without a change in Moscow, and 17 domestic flights operated out of Vnukovo. Ten of the routes are to international destinations. Since the beginning of operation on December 1, 2014, the airline has carried 7.121 million passengers. The net profit of the carrier is expected to exceed 2 billion rubles ($31.3 million). Aeroflot’s plans for Pobeda include increasing the low-fare carrier’s ranking on the Russian market to third place. Pobeda plans to increase its fleet by five Boeing 737-800s in the near future.